A drug ursodeoxycholic acid (UDCA) that is used to treat primary cirrhosis in liver disease may also be able to treat Parkinson’s disease and Alzheimer’s disease. The results were published by researchers from the University of Sheffield in the UK, August 29, 2018, in the Journal of Molecular Biology. Previous research had suggested that UDCA might be able to halt the progression of Parkinson’s disease by improving the function of the mitochondria in the nerve cells in the brains of people with Parkinson’s. Mitochondria play a very important function in energizing cells, so that they can grow, divide and form new cells. It has been shown that some diseases come about when something disrupts or damages the mitochondria of cells and this is often one of the earliest stages of a disease that may go unnoticed. Research has also shown that mitochondrial dysfunction is part of the disease pathology in Alzheimer’s disease and appears to occur before the formation of toxic beta amyloid protein into plaques and the formation of tau protein into tangles in the brain. The researchers actually used tissue taken from Alzheimer’s patients and saw that UDCA really improved the function of the mitochondria in the cells of patients with Alzheimer’s disease by increasing the mitochondrial membrane potential and respiration and changing the length of part of it. The researchers also saw that UDCA improved mitochondria in AD fibroblasts of animal models of both AD and Parkinson’s disease. Since the drug has already passed approval for use in humans with liver disease, it may not take so long to get it approved for use in humans with Alzheimer’s or Parkinson’s disease. Alzheimer’s is the most common neurodegenerative disease followed by Parkinson’s disease. Both diseases show a disruption to mitochondrial function. What has not yet been discovered for either disease is what is the trigger that causes the mitochondria to dysfunction? The herpes family of viruses have been found in post-mortem samples of brain tissue of people who died from Alzheimer’s. The herpes family of viruses stay forever in a person even after the disease subsides and they go dormant. In some cases like the herpes zoster virus that causes chicken pox in children, the virus becomes active again in old age and causes the disease called shingles. Fortunately, today there is a vaccine for both chicken pox and shingles. Shingles in the elderly is a viral disease that can do a lot to upset quality of life. A recent study found the herpes roseola viruses in the post-mortem brain samples of people who had Alzheimer’s disease. The National Institute on Aging (NIA) has launched a clinical trial to treat people with early Alzheimer’s who also test positive for the herpes simplex virus with the anti-viral drug valacyclovir (Valtrex®) that target herpes family viruses and is usually prescribed for people with shingles. People with early Alzheimer’s will be followed until 2022 to see if this anti-viral drug can stop the progression of Alzheimer’s disease, which might prove that herpes viruses can cause Alzheimer’s disease. An association has been found with bacteriophages and Parkinson’s disease, but more research is necessary to determine if these bacteriophages are the cause of Parkinson’s disease. This study was published in Scientific Reports, July 17, 2018. Parkinson’s disease causes considerable motor function disability and many late stage Parkinson’s afflicted people may need long-term skilled nursing care. Alzheimer’s disease mainly causes mental dysfunction, memory loss, personality changes and psychiatric behavior disorders, but does not usually affect motor function. In fact. 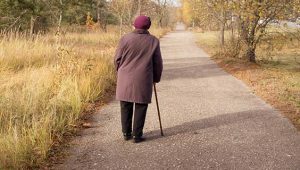 many people with Alzheimer’s tend to wander and they sometimes get lost. The Royal Suites Healthcare and Rehabilitation in Galloway Township, New Jersey has a state-of-the-art impaired memory care unit for people with advanced dementia and they also have a high ratio of skilled staff for patients, so someone with Parkinson’s disease could also get a lot of attention, as well as the benefits of skilled physical, occupational and speech therapists. We can only hope that these studies will bear fruit and that a cure or a way to stop the progression in Alzheimer’s disease and Parkinson’s disease will be found.